Trick and treat are combined in this collection of custom Halloween Lego minifigs. Yes, ok, Halloween was yesterday, but these minifigs would be worth a look even in high summer. Created by Lego artist Jaime Spencer, also known as Morgan190, the collection draws on the wide range of unofficial accessories available, as well as some that Spencer created himself. What's especially cool about these figures are the dark worlds Spencer has created for them to inhabit. 'Oseos Nua, The False Seer of Mt. 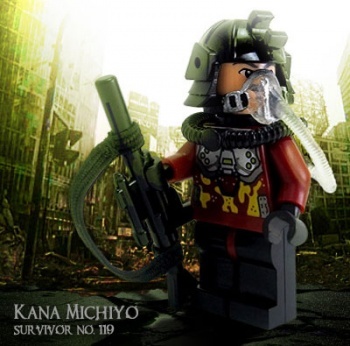 Agium' or 'Kana Michoyo, Survivor No. 119' are wonderfully evocative names and hint at a much larger narrative. You can see all of Spencer's minifigs on his flickr page.